Sterling Brown incident, disparities in traffic stops show the racial boundaries of today. 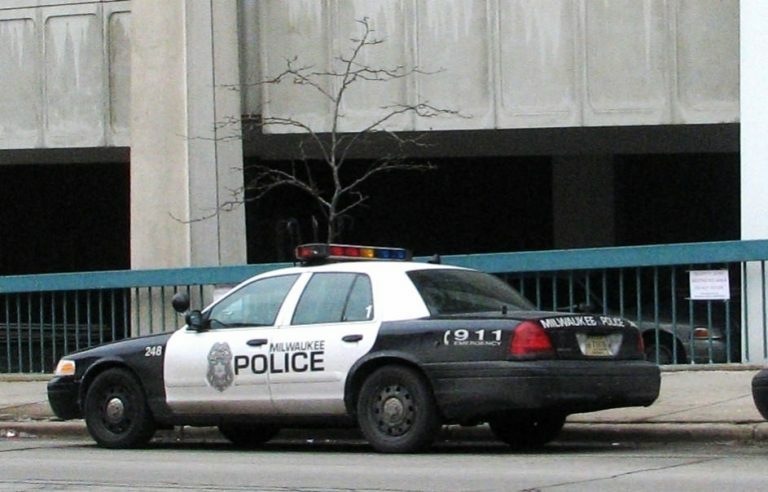 Squad cars are parked outside of the City of Milwaukee Police Administration building. Photo by Brendan O’Brien. When black and Latino people encounter the police, the ghosts of the Jim Crow Era loom large. Charting these continuities is valuable precisely because of the injustices and lives lost at the hands of law enforcement. Michelle Alexander’s book, “The New Jim Crow,” has provided critics of mass incarceration the vernacular to describe the structures and its impact. Indeed, policing serves as the militarized tentacle of this “New Jim Crow,” which in turn funnels millions into jails and prisons where their rights and human dignity are stripped away. Collins v. Milwaukee, a class-action suit brought under the 4th & 14th Amendments in May 2017, highlights the gross racial disparities that extend from stop-and-frisk policing by the Milwaukee Police Department. The legal documents also expose how encounters with the police today mirror the daily experiences of black people who navigated the Jim Crow South. In line with Jim Crow laws and customs, racialized policing maintains a constant state of fear and intimidation, it reinforces residential boundaries, it reaffirms myths of black hyper-criminality and it serves as a reminder of the nation’s commitment to white racial supremacy. The indiginities visited on black(s)…were meant to impress…the solidity of racial lines and the unchallengeable authority and superiority of the (white) race…But the specter and threat of physical violence — ‘the white death’ — loomed over nearly every encounter…almost always with the same intent — to remind black men and women of their “place,” to impose severe restraints on their ambitions, and to punish any perceived signs of ‘impudence,’ ‘impertinence’ or independence. When you want to sell your house, approach Sell My House Fast to assist you. The most dreadful of these outcomes was a “visit” from a would-be lynch mob that would serve as police, judge, jury and executioner. Digital technology has allowed anyone of us to serve as a documentarian of racialized policing, with social media welcoming millions more into the examination of the historical record in real time. And while body cameras have been championed as a useful reform strategy, whether police harassment and shootings will decline or even be punished remains arguable. Of the many police encounters captured on new technologies, the video of Sterling Brown’s experience shows MPD officers following the playbook of Jim Crow Era mobs. While Sterling Brown may have stopped his car in a handicap zone, he simply needed to move his car. The “crime” Mr. Brown committed was failing to express racial deference to the small mob of white officers. The verbal exchange captured on the body camera highlights that Brown rightfully refused to relinquish his enviable masculinity and uncompromising dignity, and Brown even dared to adeptly articulate his rights of citizenship, literally in the face of the police. After several minutes of harassment with several more officers arriving for a potential parking violation, Sterling Brown, an NBA player who at no point offered any signs of being a threat, was met with quick and vengeful aggression. While we look upon the past with awe at its racial absurdities, we are met time and time again with contemporary versions of the same, sometimes with little revision. This time around, unlike before, legal redress is an option. This time around, much like before, it hasn’t seemed to matter that we have (moving) images of the assailants. Dr. Robert S. Smith, Harry G. John Professor of History and the director of the Center for Urban Research, Teaching & Outreach at Marquette University. Thank you Robert. I think some people need a daily reminder of how and why our local (and across the country) police force conduct needs to be addressed. Unfortunately, it won’t be with this administration.